Growing up in a deeply conservative Republican household, I always had an interest in politics but I never had a very profound understanding beyond partisan rhetoric. Bill O’Reilly was my hero, and Ronald Reagan was a god among men. Liberals were loons and wanted to destroy America with the power of big government. Life was simple back then. But when the fallout of the Great Recession sparked a period of political instability after 2008, the emergence of two American populist movements- the Tea Party in 2009, and Occupy Wall Street in 2011- posed daunting questions of political philosophy to the adolescent me. I mark this period, then, as the formative stage of my political education. First came the Tea Party. I was initially entranced by this grassroots conservative movement, and fell in with it immediately. Its paeans to liberty and denunciations of government appealed to me immensely, and I soon decided to become a true Tea Partier and become acquainted with the works of the Founding Fathers, to discover what they really said and meant. Of course, the first founder I chanced upon was Alexander Hamilton, and I soon discovered that the Tea Party’s absolute denunciations of government in no way reflected this founder’s- indeed, most of the founders’- actual philosophy. I was disillusioned. I became a political realist of sorts, no longer strongly identifying with the Republican Party but still maintaining my Republican Instincts. Years later I went to a Tea Party rally at the Capitol, complete with a man in stockings and a tricorn hat. The speeches were about as far removed from the actual rhetoric of the Founders as I had discovered they would be years before. Around the time I was reading Hamilton, the Occupy Wall Street movement sparked up in New York City. I was immediately turned off by it, disgusted by its utopian denunciations of inequality and unfairness. My instincts as a tragic political realist sharpened, and I crowed at the populist masses who dared protest something as natural as nature itself. Some friends of mine back in Seattle started going to Occupy Seattle rallies, and I thought therefore it would be good to familiarize myself with the movement personally. I was living near DC then so I went to the Occupy DC camp at McPherson Square, and spoke with some of the inhabitants. I found a group of people earnest in their beliefs, and though I disagreed with their more radical ideas I generally found them to be ordinary people with typical concerns. My brief flirtation wih and subsequent rejection of the Tea Party taught me not to fear government, but to request its efficiency; my disgust with the Occupy movement engendered in me a loathing of popular unrest, but a conviction that the sources and causes of that unrest must be fought vigorously by government. These experiences helped solidify two of my basic political instincts- that government is not a necessary evil but a positive good when efficient and limited, and that it is the duty of government to work to make things better for the masses of the people. In an era of anti-government Republicans and big-government Democrats, both in bed with Wall Street, I did not (and still do not) fit easily into any conventional political categories. As my political self-education continued, I discovered that there was, indeed, a tradition in American history, now defunct, that represented the basic ideas and convictions I shared. Over time I began identifying as a Hamiltonian and as a Progressive Republican. The Hamiltonian side of my political conscience dictates that government ought neither limit itself severely nor grow so monstrous as to be cumbersome, but instead must make strategic investments to promote broad-based economic growth while maintaining order, security, and representative accountability. It ought to be centralized where necessary and decentralized where possible. Above all things, the national interest of greatness and the provision of opportunities for entrepreneurial individuals are the two most crucial ends of governance. Along with this emphasis on the nature of the state, the Progressive Republican side of my political conscience dictates what must be done when a government and society has decayed, as has ours. The stranglehold plutocrats have over governance must be fought vigorously if representative and efficient government for the people is to be maintained. Meanwhile, governance itself is to be modernized for the times, opening as many possibilities and opportunities to individuals in a liberal society as is possible while maintaining a basic quality of life. Progressive Republicanism is very much about reform. My political philosophy is basically a mix of these Hamiltonian and Progressive Republican impulses, with some other things thrown in the mix. 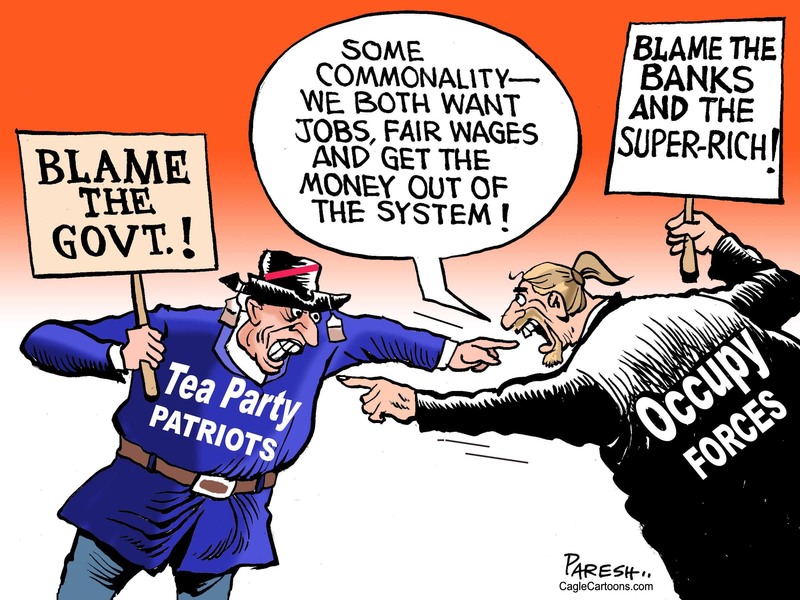 Of the two principles of Progressive Republicanism- efficient governance and anti-plutocratic crusading- it seems that the two populist movements of my youth, the Tea Party and Occupy Wall Street, embody popular frustration with the current malaise in both of those areas. In a sense, then, the Tea Party and the Occupy Wall Street movement were and are both correct about the ills facing American society. But neither a radical right nor a radical left approach can remedy those ills. In my opinion, only the relatively centrist yet reformist Progressive Republican ideas can do that. There are two potential presidential candidates out there, I think, who embody these reformist impulses. On the left, representing the passions of Occupy Wall Street, is the centrist-populist Democratic Senator Jim Webb. On the right, representing the passions of the Tea Party, is the Republican Wisconsin Governor Scott Walker. Walker, in his denunciations of and attacks on bloated government programs and unions in his home state, and Webb, in his appeals to middle-class growth and Jacksonian anti-elitism, embody the two areas of reform our country sorely needs right now. Unfortunately, I don’t think either is going to get their party’s nomination, nor do I think either will be the next President of the United States. But their influence over the debate is worth thinking of at least. With luck, the reformist passions currently floating around the radical wings of the Right and Left will soon consolidate under a centrist progressive movement, capable of executing necessary reforms and uniting the country. Under such a regime, we would see a truly grand new era in American politics and history. But I’m not holding my breath or anything.